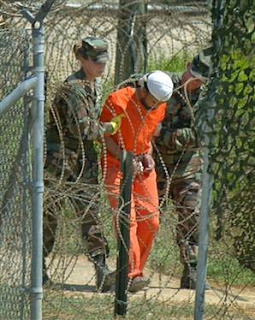 The ACLU is angry that a military judge has accepted an incendiary legal pleading filed by five 9/11 suspects, despite President Obama’s order stopping the Guantánamo military commissions and even though attorneys for some of the defendants were unaware of it. Judge Col. Stephen Henley, the appointed chief trial judge in the case ordered the public release of the legal pleading even though all other legal filings have been kept sealed for months by the military commissions, said the American Civil Liberties Union in a release, adding that the competency of two of the men has not yet been determined. The Smoking Gun has the released six-page legal pleading here. “We fight you over defending Muslims, their land, their holy sites, and their religion as a whole,” reads the document. The five men are charged with murder and other crimes, charges which could carry a death sentence if they are found guilty. The ACLU is calling for Secretary Gates to withdraw all charges in all pending military commission cases. They have sponsored civilian counsel for some of the five men through a partnership with the National Association of Criminal Defense Lawyers. White House press secretary Robert Gibbs said Judge Henley’s decision to accept the detainees’ legal pleading was not troubling at a press conference this afternoon. FOX News reporter Wendell Goler asked Gibbs if the decision by the judge to accept the legal filings was troubling, given President Obama’s order that the military commission proceedings be halted.